At Anchorage Dental Care we care for you, as much as we care for your teeth! 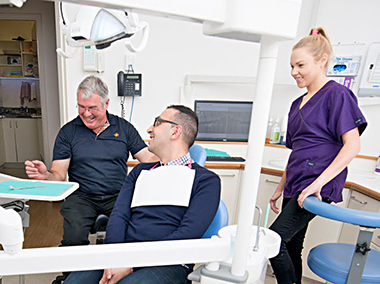 Find out about our services designed to look after your family dental needs – call us today! When you first call Anchorage Dental Care to schedule your appointment, our reception team will make sure you have all the information needed regarding what will happen at your appointment. We’ll help you feel comfortable and explain what you can expect. When you first arrive, our friendly team will greet you. We will ask you to fill out some new patient medical history information. When that’s completed, you’ll be welcomed into the treatment room by our nursing staff, who will introduce you to the doctor right away. To prevent any future dental problems, our practice has developed a program to schedule regular hygiene maintenance appointments for each of our patients. This prevention program will help you save time and discomfort, and it’s simple to do. We’ll schedule your next visit immediately and send you a reminder via sms, email, phone call, or a letter when the appointment nears. Remembering your future oral health check-ups will be easy. Let us help you maintain your oral health. Call our Mindarie Dental Clinic today to schedule your first visit.